The all new 618 Dct epipe electronic cigarette now with a replaceable Dct tank system using a 510 thread. The new innovative 618 Dct e pipe allows you to use it in several ways, since the pipe comes with a 510 thread, all 510 devices will fit this pipe. 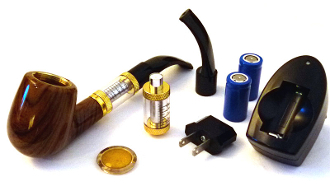 The DCT 618 e pipe uses a 900mAh battery and will work great with high ohm clearomizer heads like the vivi nova. Add an ego case to your Dct Tank kit and carry it with style. Ladies, you can change up your style with this e pipe and make it short and sassy, or Gentlemen you can use it like it was intended, long and classy. 2 - 2.5ML e Pipe Tanks Gold Threaded.